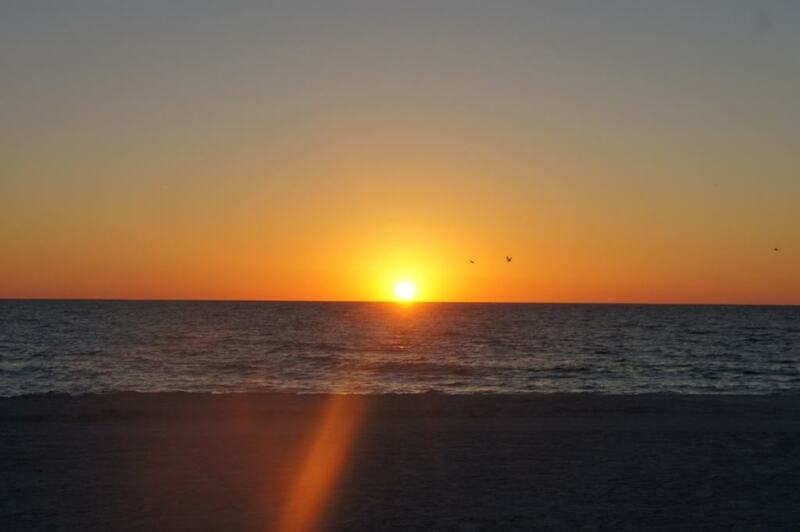 Tucked along the teal-colored Gulf of Mexico, Anna Maria Island sits on a tiny spindle of land at the mouth of Tampa Bay. There is no grand dame hotel, no sprawling wildlife preserve, no historic waterfront. The island is dominated by palm trees and low-slung Crayola-colored beach cottages and scores of renovated old-timey motels. 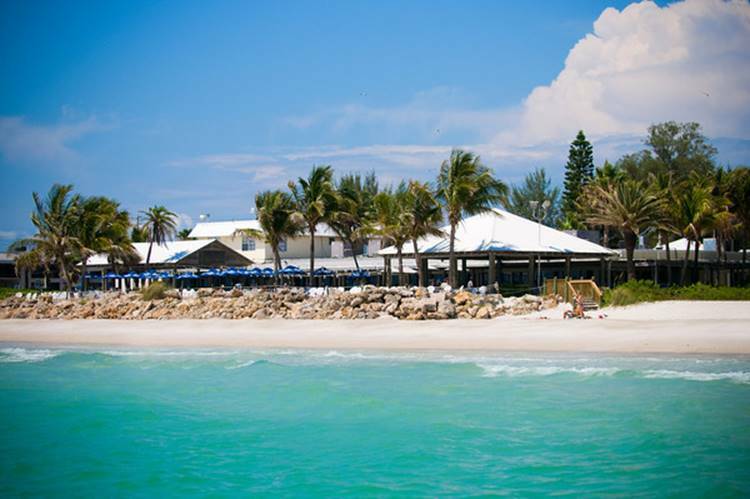 Set on a slim barrier island about an hour south of Tampa, the ladle-shaped seven mile long island is actually three small communities – Anna Maria to the north, Holmes Beach in the middle and Bradenton Beach to the south. The beach is never more than a few blocks away with wide open stretches of sugary white sand that slopes down to the vivid emerald water. You can spot residents. They slap those oval, European-style stickers (AMI) on their car bumpers. When you get the urge, there is plenty to do. Snorkel in the placid Gulf waters. Rent a kayak and paddle Robinson Preserve, a 400-acre mangrove and salt marsh where you might spy mullets jumping high in the air or bald eagles sitting regally in a tree. A manatee swims lazily out in the Gulf, while ten yards from shore dozens and dozens of young stingrays migrating their way down the coast. The Calusa Indians were the first inhabitants of the region who harvested abundant supplies of conchs, clams, oysters and fish. In the early 1500s Spanish explorer Ponce de Leon discovered and named the island Ana Maria Cay in honor of the Virgin Mary and her Mother, Anne. Just before the turn of the 20th century Charles Roser, who won fame for creating the legendary Fig Newton, sank his million-dollar windfall into developing real estate in Florida. His Anna Maria Beach Company built the streets and laid out the town. Home sites were hacked out of a jungle. Residents and visitors came by boat until a bridge was built in the 1920s. 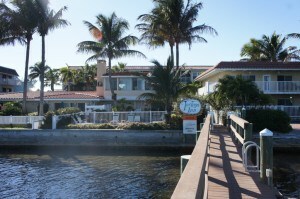 The community has had more success than most coastal towns in Florida keeping out developers. But here’s the good news, bad news. AMI was recently ranked No. 4 on Trip Advisor’s Top Ten U. S. Islands. During the winter season the Gulf Drive can be congested, so many visitors leave the driving behind, hopping aboard the free trolley (actually a bus designed to look like a trolley) that ferries visitors up and down the main thoroughfare. It’s a great way to get acquainted with the terrain on the ride up to the northern section where colorful boutique shops and mom and pop restaurants add charm. Ginny’s and Jane E’s Bakery Café and Island Coastal Store is a local institution, a former IGA grocery store that now houses a maze of mismatched tables, books and beach “collectibles.” It’s the breakfast place where locals come to jaw and joke. Try an egg sandwich or a scrumptious blueberry muffin. If you want to indulge, opt for a freshly baked cinnamon roll blanketed with glaze. They are Frisbee-sized. The Sandbar anchors the north end of the island. Park in the wispy shade of Australian pines and bring your appetite. Try the crunchy, pepper-dusted calamari with a flaky mahi-mahi sandwich paired with a local brew. Guests are invited to guess the time the sun drops. The winner earns a bottle of champagne. Cyclists pedal through Bayfront Park, adjacent to the Anna Maria Pier. Recently renovated, the pier juts 776 feet into Tampa Bay affording a panoramic view that includes the dazzling Sunshine Skyway Bridge. Packs of anglers turn up all day long. Bring your fishing gear or rent a pole and pull in redfish and mackerel. Or just kick back and watch manatees and dolphins putting on a show. 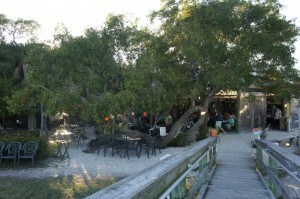 We bunked at the Tortuga Inn Beach Resort located near the southern end of the island. Tucked amid palm trees and garden oases, it’s a modern resort with the relaxed charm of an old-fashioned Florida beach resort. Across the road from the newly replenished beach, Tortuga offers stylish suites (some the size of luxury apartments), comfortable accommodations and is pet friendly. Each day we walked from the sparkling swimming pool through a lovely palm court and garden to our spacious second story unit that overlooked the Intracoastal Waterway. Head a little further south and go east over the drawbridge to Cortez village, home to the dockside joint, the Star Fish Company. It is one of the few remaining working waterfronts left on the Gulf coast. It’s the perfect place to enjoy fresh the Gulf’s delectable seafood in T-shirts, shorts and flip-flops. Or take home super-fresh seafood from their market. The A.P. Bell Fish Company out front is a giant garage of fish packing and distribution that opened in 1940 and has supplied food to restaurants around the world. Star Fish’s outdoor eatery is as bare bones as it gets– a small kitchen, cash-only counter, and eight picnic tables behind its wide-ranging seafood market. Plus you get a superlative view off Sarasota Bay of an island sanctuary of mangroves, Jewfish Key and Longboat Key. 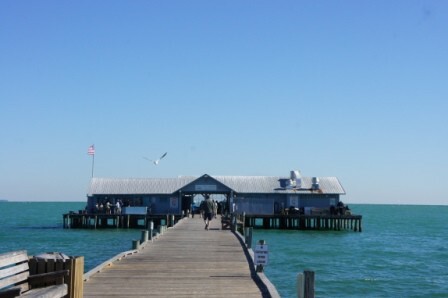 Swooping pelicans, and stilted fishing sheds are iconic Florida. Above, nothing but blue skies. You walk up to the right side of the bar off the dock and order your food through the window and pick up it up in paper boxes. Grouper, mullet, shrimp, and oysters are grilled, fried, blackened, or sautéed and teamed with their famed hush puppies, coleslaw and French fries. If you have room, we say go for the Key lime pie. Restaurants have snatched some of the island’s best real estate. 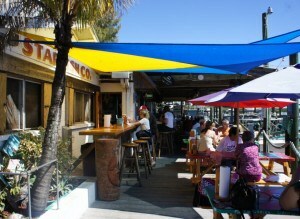 There are an array of laid-back, watch-the-sunset kind of eateries and watering holes. Pay a visit to the Beach House and the Gulf Drive Café. Late one afternoon we travelled over the bridge at the southern end of the island into Longboat Key for dinner at Mar Vista set on the shores of picturesque Saratoga Bay. Mar Vista was built in 1912 as a fishing hut with rustic concrete blocks made onsite. The original house section is considered one of the twelve oldest surviving structures on Longboat Key. Guests arrive by car or boat, tying up at the pier. My wife and I dined at the water’s edge at an outdoor table below gnarly old Buttonwood trees and were entranced by the gold and cranberry-streaked sunset. We started with an appetizer of local treasure stone crab claws paired with a lovely soft white burgundy. We followed that with blackened fresh cobia served with baked artichokes and Mar Vista rice and the sea bass served with potato medley. Both were superb. A scuba instructor by day and Mar Vista manager at night, Jim Harwood pointed out seasoned regulars often opt for the crab and Ritz cracker scallops served with artichoke hearts, tomatoes and mushrooms. All of this, while taking in the view of the bayside pier that glows into the evening with gorgeous underwater lights. We’re up early the next morning on AMI gazing at a few brown pelicans diving-bombing into the Intracoastal Waterway to trawl for their breakfast. It’s a fantastic sight. The entire island is blessed with birdlife, in part due to its sanctuary status. AMI is also home to an abundance of cranes, herons, wild parrots, sand pipers, hawks, vultures and seagulls, as well as beach nesters including black skimmers, American oystercatchers, and snowy plovers. Five species of sea turtles swim and feed around Anna Maria Island. Known for their digging ability, their burrows can be 40 feet long and 10 feet deep. The loggerhead turtles lay eggs on these wide-open beaches. Whether grazing on sea grass, controlling sponge distribution, feasting on jellyfish, transporting nutrients or supporting other marine life, the sea turtles play vital roles in restoring the health of the Gulf of Mexico. The terrapins are a fitting symbol for this Old Florida destination.